The alcatel 1x was announced back in February at MWC. Then in March we found out that it would be offered in the US among other markets. And today it's finally gone up for pre-order in the States. You can pick up an unlocked unit for the low, low price of $99.99. The 1x will be released on June 4. The low price tag makes this a somewhat interesting offering, though keep in mind that it is decidedly low-end. On the other hand, it boots Android Oreo (Go Edition), a version of the OS that Google has developed and optimized specifically to run well on such low-end hardware. 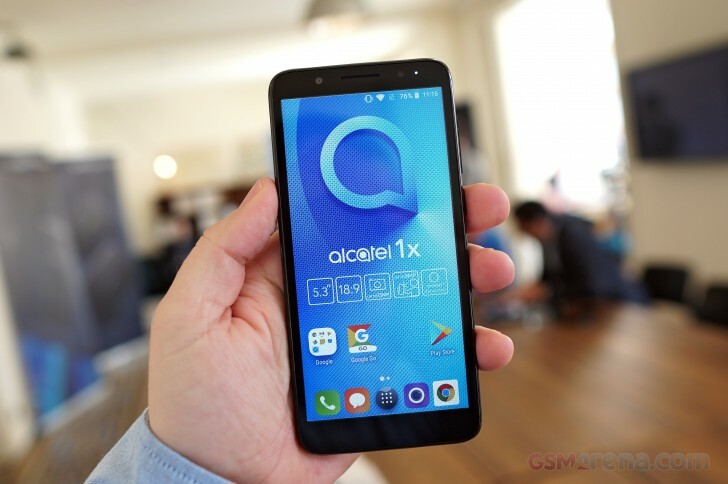 The alcatel 1x has a 5.3-inch 480x960 18:9 touchscreen, an 8 MP rear camera, a 5 MP selfie shooter (both with flash), 1GB of RAM, 16GB of expandable storage, a 2,460 mAh battery, and the MediaTek MT6739 chipset at the helm (with a 1.3 GHz quad-core Cortex-A53 CPU). It's compatible with AT&T and T-Mobile and even has a fingerprint sensor on the back. Connectivity-wise, you get 4G LTE, Bluetooth 4.2, GPS, and 802.11n Wi-Fi. The 1x charges through a microUSB port. Please also review user experience after installing Twitter /fb, telegram/wa, e-bay/Amazon. Will 1 gb "smartphone" enough?